After traveling around Asia for 2 weeks, it feels good to be home. This was a fantastic trip! It was what we called the Empty Nester Celebration. This year our youngest son went off to college. As much as we miss having the kids around, it is certainly worth celebrating that my husband and I raised 3 incredible kids and they are pretty much on their own now. 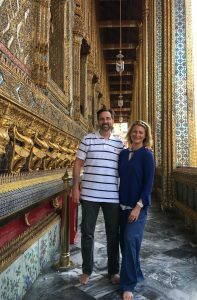 Our cruise started in Hong Kong and then we traveled on to Vietnam, Thailand, and Singapore. We saw a lot of interesting places, met a lot of interesting people, and ate a lot of delicious food. 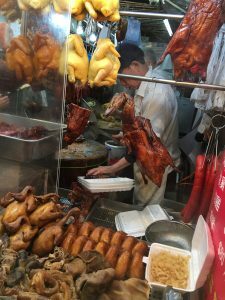 A big highlight of our trip was the cooking class we took in Hong Kong. 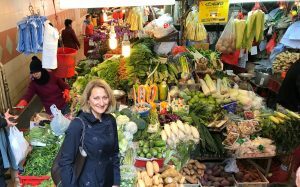 Our cooking teacher took us to the wet market first, a farmers market selling meat, and fresh produce, and other food items. This was fascinating! So many fruits and vegetables that we’ve never seen before. We tasted a rose apple. Sweet and juicy, this fruit reminded me of a cross between celery and an apple. Lots of fresh fish for sale, as well as duck, chicken, lamb, and other meats. All kinds of organ meat was available for sale. 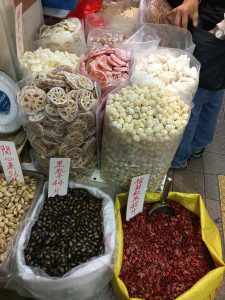 Bins were overflowing with candies — lotus root candy in different shapes and colors which is traditional for the Chinese New Year. The lotus root is symbolic of abundance. 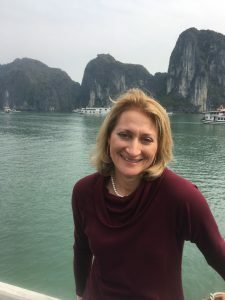 My favorite place to visit had to be Ha Long Bay, Vietnam. 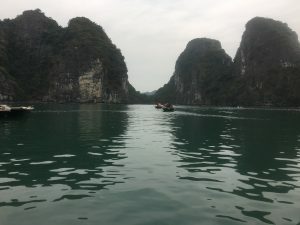 With all the hustle and bustle of Hong Kong, Saigon, and Singapore, this tranquil bay with deep green-colored waters, and hundreds of limestone rock formations surrounding it was a welcome change – peaceful and relaxing, and awe-inspiring with all its beauty. My favorite foods were in Thailand. 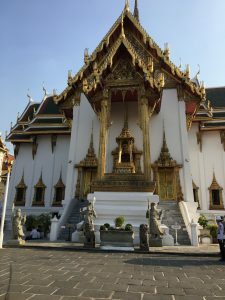 The Thai cuisine is so interesting! 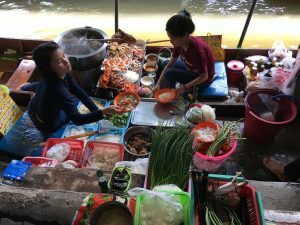 The Pad Thai dish we ate at the floating market was sweet, salty, spicy, and sour all at the same time. It was like a party for your mouth! 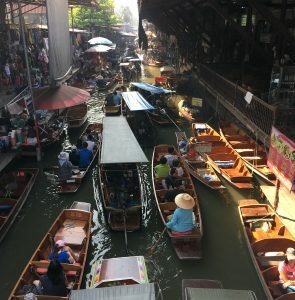 It was fascinating to watch the women paddle up in their canoes and cook the food in their boats right in front of us. I love seeing how other people live! 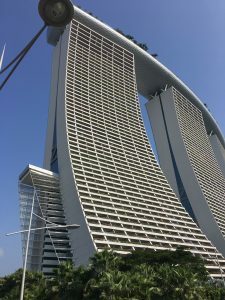 The architecture in Singapore was spectacular! Each skyscraper with its own architectural style. 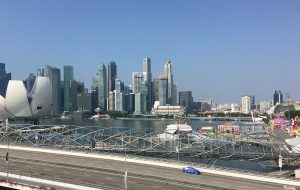 So many unique buildings standing out as special on their own, yet they all worked well together to make up this impressive Singapore skyline. This is a well-planned city that is clean and orderly and was easy to enjoy. After 2 incredible weeks of traveling, it was time to get back in the kitchen. 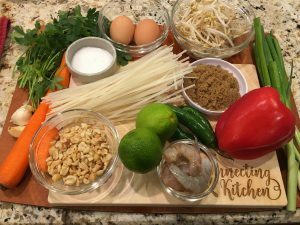 In honor of my trip to the Far East, Ari and I made Pad Thai this week, the national dish of Thailand. Quick and easy, tasty and light, it was perfect after 2 weeks of over eating and over indulging. The best was that we enjoyed making this meal and eating it together. Heat a large pot of water until boiling. Add the rice noodles, turn off the heat, and let sit for 5 minutes. Drain immediately. Set aside. Whisk together the lime juice, fish sauce, Serrano pepper, brown sugar and set aside. In a large non-stick skillet or wok, heat 2-3 tbs of canola oil on high heat. Add garlic, white parts of scallions, and grated ginger. Stir fry for 2 minutes until garlic starts to turn brown. 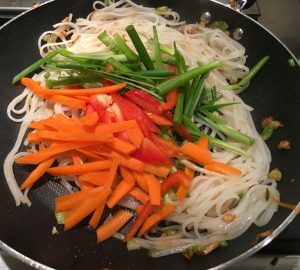 Add the drained rice noodles to the skillet and stir for 2 more minutes. Add the sliced carrots, bell pepper, and green parts of the scallions. Mix together. 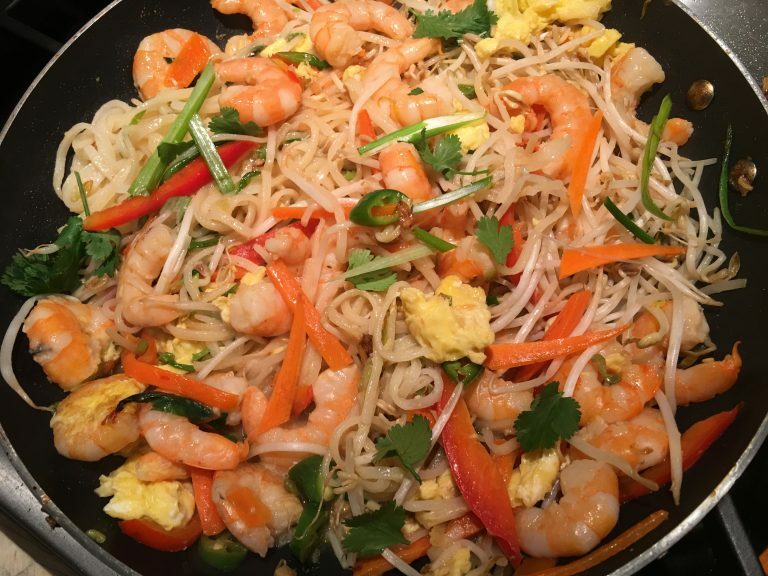 Add the shrimp and stir fry for 2-3 more minutes until the shrimp start to turn pink and are partially cooked. Push the noodles to one side of the pan leaving room to fry the beaten eggs. Add a tablespoon of canola oil in the space and add the eggs. Let the eggs set a little and then stir a little to break them up as they cook. 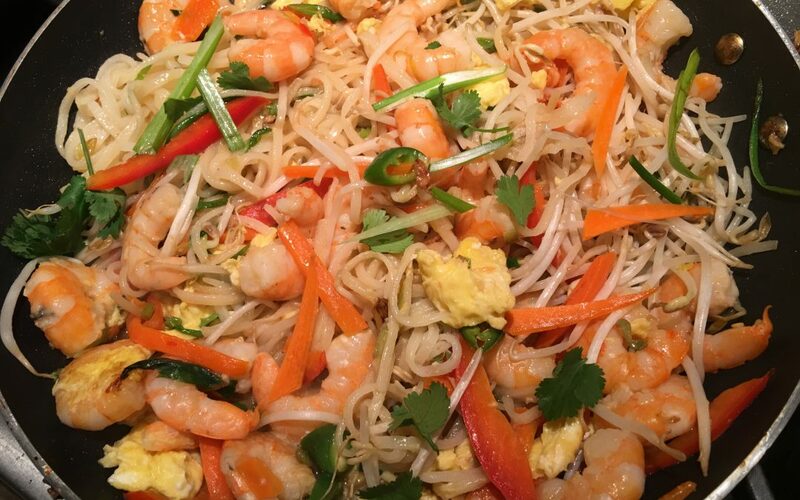 Stir the eggs in with the noodles. Add the fish sauce, brown sugar, chili mixture to the pan. Add the bean sprouts and stir to combine. Heat for 1 more minute. Spoon onto plates. Top with chopped peanuts, chopped fresh cilantro, and serve with lime wedges.